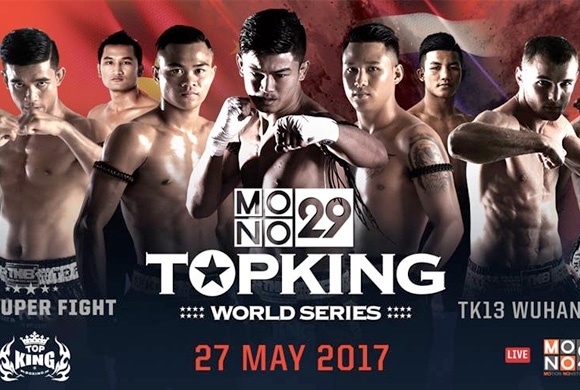 TopKing World Series get 2017 underway with a series of superfights set for Wuhan, China on the 27th Of May and televised live in Thailand on MONO 29 at 18:20 Thai time. Highlight of the show sees Sangmanee Umkatongchiangmaimuaythai gym face of against Italian fighter Mathias Gallo Cassarino, who has based himself in Thailand for several years now. Also representing Thailand on the card are last years tournament winner Yodwicha Khemmuaythai gym, Rungrawee PKSaenchaimuaythai gym, Yodkhunpol Mor Ratonabandit and Chujaroen Darpransarakham. There is also an explosive mat cup between Thailand’s Rotthang Jitmuangnon and Scotland’s Craig Dickson.